All wine lovers know that wine is fragile. It needs careful attention and the best storage environment to reach its full potential. However, the conditions that are conducive to this seldom exist in the cellar of an old house, let alone the modern home where there is no traditional cellar. The traditional cellar does not exist. At Wine Corner we can offer the solution to this problem, no matter how large or small your wine collection might be. We do not believe in resting on our laurels. Commitment to a programme of continual product development ensures that we always provide our customers with a wide range of products that offer optimum levels of performance and reliability. A digital control panel is used to set the conditioner to the required temperature and can be checked at a glance to ensure that your wine storage conditions are optimal. Vibration is not good for your bottles; it can result in deterioration of the wine. With our cellars, all moving parts are mounted on rubber shock absorbers which absorb the vibrations. All our conditioners are equipped with an electronic thermostat with digital display. Accurate and reliable, it automatically maintains the required temperature (8°C – 14°C). They are also equipped with a resistor so that you can heat the atmosphere if necessary. 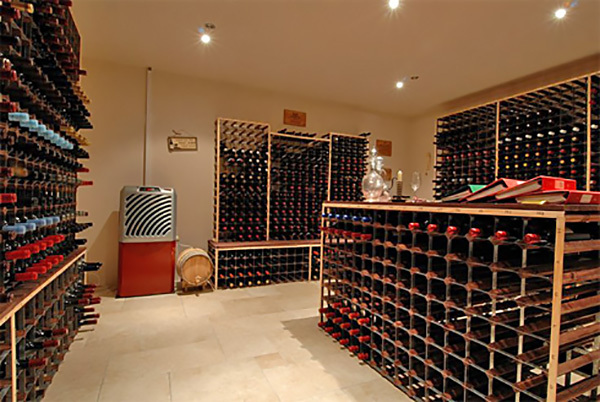 Your cellar will be maintained at a constant temperature all year round. To avoid wide variations in temperature between floor and ceiling, the unit permanently circulates the air in the cellar, thus preventing any stagnation. Excess humidity promotes the growth of mould. On the other hand, an atmosphere which is too dry threatens the cork seal. The ideal relative humidity level is between 60 and 80% and it varies with ambient temperature. The operating principle is to condense excessive moisture and evacuate it. Indeed, the evaporation temperature (on the cold side) has been designed and adjusted to avoid drying the air excessively and to maintain humidity at the required level. All conditioners are fitted with interchangeable dust filters. With use, the heat exchanger becomes loaded with dust, preventing the device from cooling properly, which leads to an increase in gas pressure and could eventually destroy the compressor. The filter considerably reduces the deposit of dust and also facilitates cleaning. Particularly silent fans and acoustic foam keep the units very discrete. The Wine C50S model also has a pressure switch which adjusts the speed of the outside fan according to need, thereby reducing noise even more. Laboratory measurements on the most powerful model in the range recorded only 47dB 1 metre from the device and 43dB at 3 metres. All our conditioners run on R404a gas, an ecological coolant with no CFCs, which conserves the ozone layer. Compared with other gases, such as R134, this gas gives the compressor greater power while reducing the space required and controlling electrical consumption. The compressor’s cooling capacity also helps to increase its life span. With a bespoke, quality wine cellar design and installation, you can now purchase young wines, particularly vintage wines which will increase in value as they age. You can store a large number of bottles (several thousand), which is a great advantage, particularly when compared with wine cabinets, which have limited capacity. 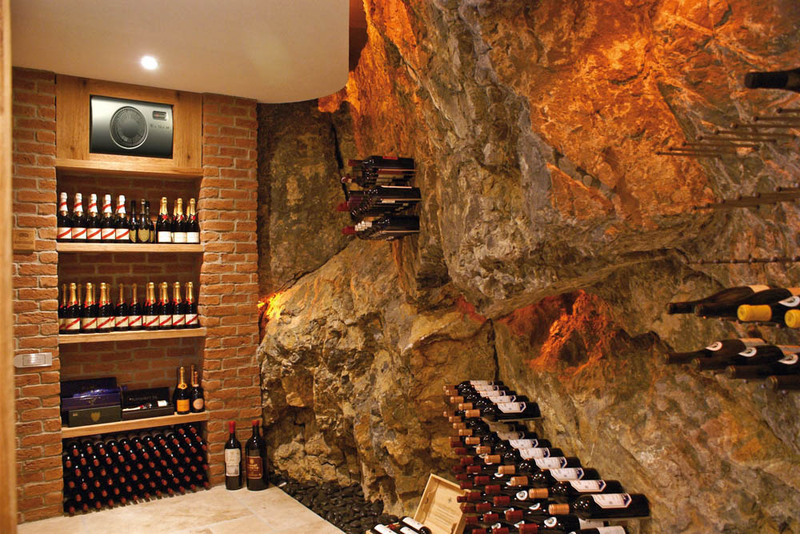 Wine Corner can provide ideas and recommendations regarding wine cellar design and construction as well as the most appropriate wine storage solutions. 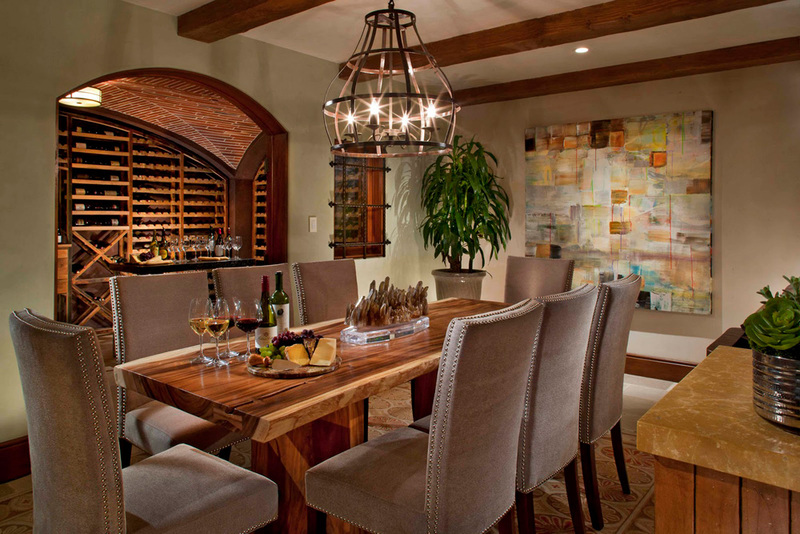 We can develop a plan that meets your objectives, so that your cellar is just right for you. From start to finish, we manage and supervise the building of your cellar to ensure that budgets and schedules, as well as specifications, are followed. The photo was kindly provided by a Wine Corner customer. 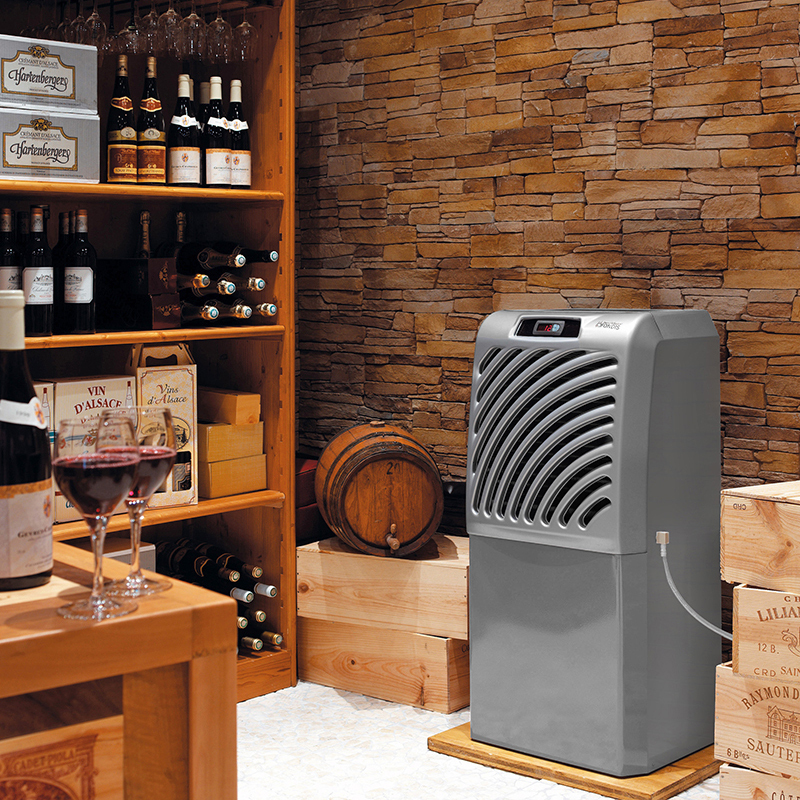 This wine cellar also included the wine cellar conditioning unit SP100 from Wine Corner. 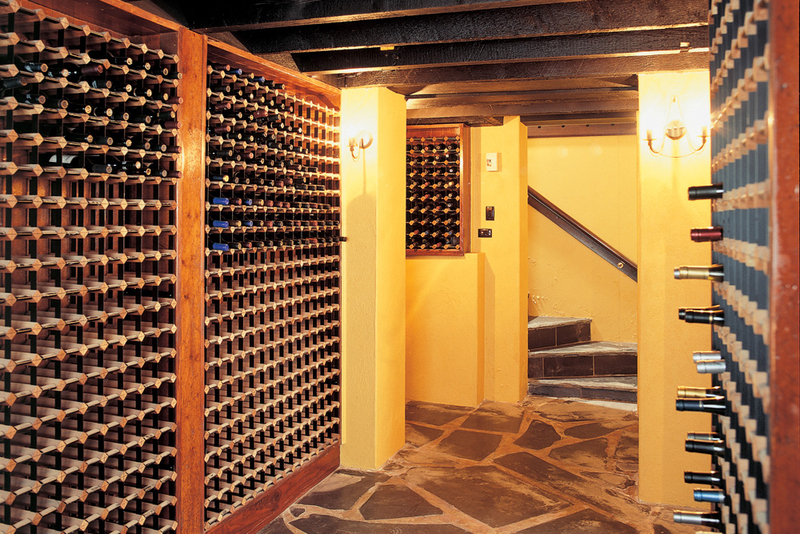 For examples of other wine cellars we have designed and built, please see our Gallery of Photos. 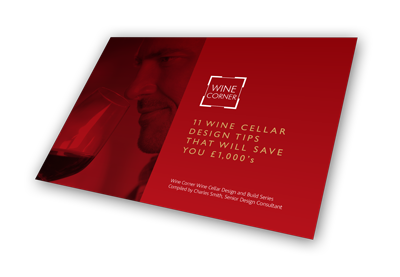 Alternatively, if you would like to find out how much your wine cellar might cost, please click the Wine Cellar Quote Request button below and complete our short form.